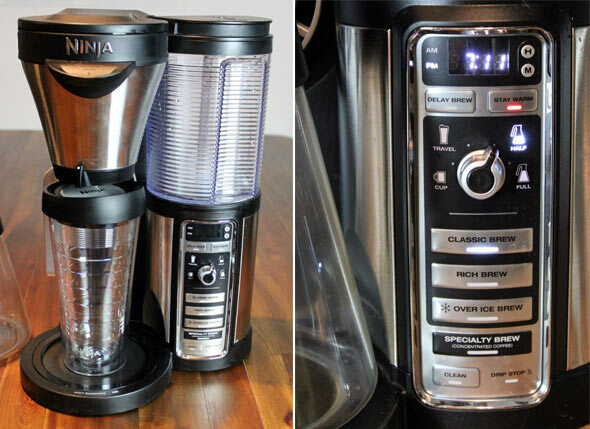 I put this coffee maker to the test over the holiday season making cappuccinos, lattes, ice-blended frappes. I also used it for my daily coffee which I take strong and black. I've been very pleased with the performance, versatility, ease of use and ease of cleaning. This unit has been retailing for around $140 which is a pretty decent price compared to more expensive machines that do less. In the last two years, I've had other high end coffee makers from Breville ($299) and Cuisinart ($180). As it stands right now, I prefer the Ninja Coffee Bar over the others. 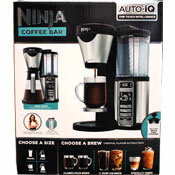 The Ninja Coffee Bar has four brew strength settings: Classic Brew, Rich Brew, Over Ice Brew and Specialty Brew. I found that the Classic Brew setting worked best for a good wake-me-up cup of Joe. The Rich Brew was my least favorite as it tasted slightly stale compared to the Classic Brew. The Over Ice setting is used to make a strong brew right over ice into an insulated tumbler (included). I don't make a lot of iced coffee, but I really enjoyed the tests I tried. The Specialty Brew setting is used to make espresso strength coffee for cappuccinos, lattes and other specialty coffee drinks. I used that setting and a dark French roast coffee to make several drinks. The quality of the finished beverages were just as good as their expensive counterparts at Starbucks or The Coffee Bean. The Ninja Coffee Bar has four different size settings for the amount of coffee you want: A single cup, a travel-size mug, half a carafe or a whole carafe. Each of those settings worked fine. The box includes a carafe and a travel-size insulated cup. I found myself using the half-carafe setting in the morning and making another half-carafe or a single cup in the evening. I really like this machine's pull-out water reservoir. The way my kitchen works, I have about 4 inch clearance from the top of a coffee maker to the cupboard above. Top-filling coffee makers are an absolute pain for me as I have to pull an entire coffee maker forward to fill it with water. With the Ninja, you remove the water compartment from the front, fill and replace. It's very helpful for making the best of valuable counter space. 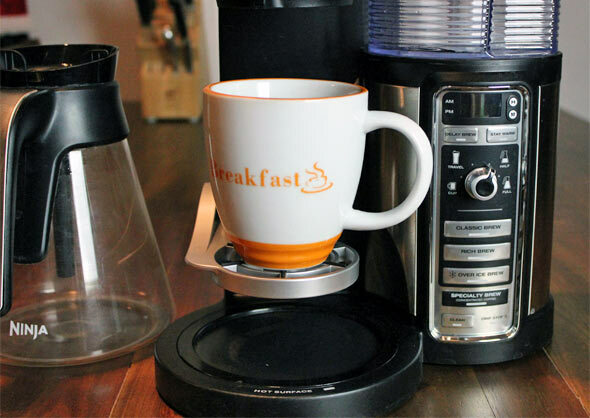 For single cups of coffee, the Ninja Coffee Bar has a drop-down shelf behind the carafe warmer. Having the coffee cup closer to the filter prevents splashing and drips during the brew. I mostly like this feature because it looks cool. As is quite common, you can set the Ninja to brew at a given time. That feature works fine. No complaints. There's a special two-side spoon included in the box to help you use the right amount of coffee for the serving size you want. It's a valuable little piece of plastic because the measurements are right on for deep, rich delicious coffee. A simple, separate, manual milk frother is included for making cafe-style drinks like cappuccinos and lattes. It looks like a small French press. You microwave milk and then pump a plunger a few times and you wind up with frothed milk. Latte purists might find this unhip as it cuts the need for fancy tools and attractive metal pitchers. But it works just as well and it's included for free. I really like this machine. After you spend a day with it, the controls feel intuitive. I haven't had a bad cup of coffee since it's been in my kitchen. The versatile, easy-to-use settings might encourage people to try coffee drinks they wouldn't ordinarily make at home. 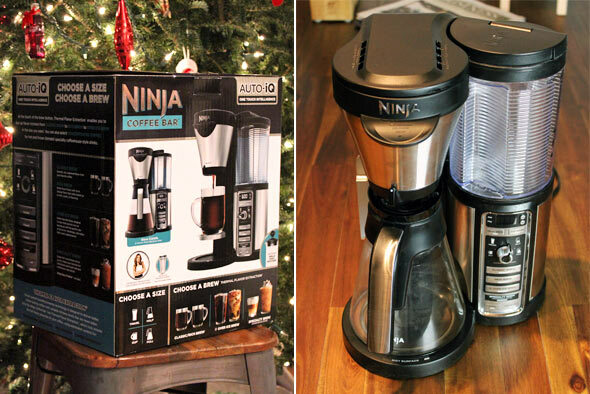 If you appreciate coffee, you'll appreciate the Ninja Coffee Bar. I hope mine lasts a long time. I'll update this review if it doesn't. 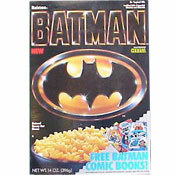 The price of $0.00 below indicates that the company provided a sample of this product to MrBreakfast.com so it could be reviewed. 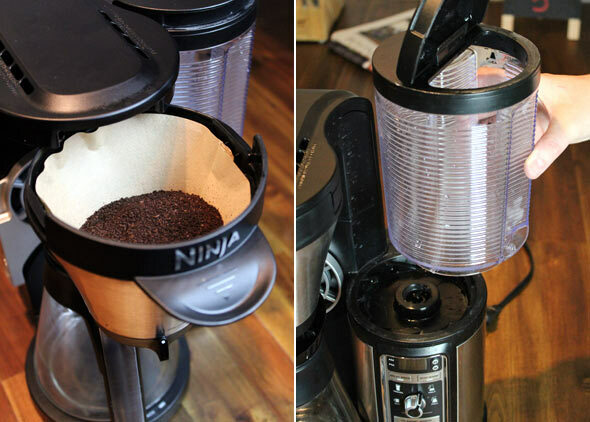 What do you think of Ninja Coffee Bar? Got it for Christmas! LOVE it! You should also mention the Sofia Vergara recipe book it comes with. I've tried 5 or 6 of the drinks and they were all really good and worth making again. Got it last week for $139 at Walmart. So far so good. Loving it.